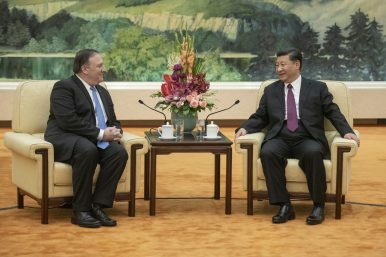 US Secretary of State Mike Pompeo, left, speaks with China's President Xi Jinping during a meetingat the Great Hall of the People in Beijing, Thursday, June 14, 2018. It may, but it doesn’t have to. While it certainly has an overtone of “contest,” it also has a distinct gentility: two opponents seeking to show their worthiness. It is a match bounded by certain rules, not a primordial struggle for survival. However, the same word can have dramatically different connotations in different languages. The most obvious translations for “competition” into Mandarin are jingzheng (竞争) and bisai (比赛), the former being a general term while the latter is used for sporting events. The 2013 Chinese military propaganda film Silent Contest provides yet another word: jiaoliang (较量), meaning a match or comparison of strength. The clear favorite is jingzheng, especially considering that bisai mostly refers to sporting competitions. One authoritative Chinese dictionary defines jingzheng as “to seek victory against one another,” citing a passage of Zhuangzi to show its origin: “Where there is force, there is struggle.” Indeed, the second character zheng, meaning struggle, is the same character that appears in zhanzheng (战争), meaning “war.” And as mentioned, Beijing sees this competition as being akin to a zero-sum game (ling he boyi 零和博弈) or cold war (lengzhan, 冷战) , alluding to the competition that ultimately doomed the Soviet Union. It is fair to say people in China see the word America uses for competition as a life or death struggle. China is probably genuine in its desire to avoid adversarial relations with the United States, as such could only harm its economy and future development. However, Beijing is also loathe to set aside its own aggravating activities, such as its mercantilist and illicit economic practices and significant arms buildup. What has changed is that Washington now insists Beijing choose either more equitable or more contentious relations. Whatever China decides, however, the leaders of both countries should be sensitive to their divergent conceptions of competition. America does not desire to weaken China through jingzheng. Rather, it seeks a responsible and strong China alongside a vibrant and thriving America, and is willing to engage in a bisai to achieve it. Beijing’s propagandists may continue to portray a threatening America intent on jingzheng, but this too is China’s choice. As a wise Chinese instructor once said, “Don’t translate words; translate meaning.” No amount of explanation can force Beijing to accept America’s intended meaning. But be sure: wherever a government is willfully ignorant, it can be shamed.